Grand Central Publishing, 9781455558308, 256pp. Sergeant Hamish Macbeth--Scotland's most quick-witted but unambitious policeman--returns in M.C. Beaton's new mystery in her New York Times bestselling series. From the author of the Agatha Raisin series. When Police Sergeant Hamish Macbeth hears reports of a haunted castle near Drim, he assumes the eerie noises and lights reported by the villagers are just local teenagers going there to smoke pot or, worse, inject themselves with drugs. Still, Hamish decides that he and his policeman, Charlie "Clumsy" Carson, will spend the night at the ruined castle to get to the bottom of the rumors once and for all. There's no sign of any ghost...but then Charlie disappears through the floor. It turns out he's fallen into the cellar. And what Hamish and Charlie find there is worse than a ghost: a dead body propped against the wall. Waiting for help to arrive, Hamish and Charlie leave the castle just for a moment--to eat bacon baps--but when they return, the body is nowhere to be seen. 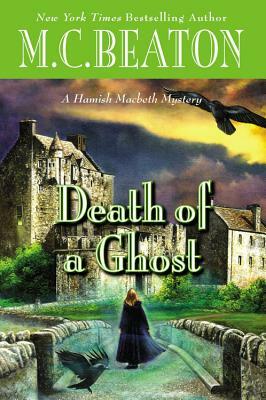 M. C. Beaton has won international acclaim for her New York Times bestselling Hamish Macbeth mysteries. The BBC has aired 24 episodes based on the series. Beaton is also the author of the bestselling Agatha Raisin series, which is now a television show starring Ashley Jensen, available on Acorn and coming soon to PBS. She lives in the Cotswolds with her husband. For more information, you can visit MCBeaton.com. "Fabulous...as usual, a real gem... a fast-paced story that includes tricks and plotlines galore. From murder to drugs to romance, Beaton provides many new characters while also bringing back some old favorites. Hamish, as always, is a riveting character that sees many things the others cannot, and when the bodies start piling up, Hamish's talents bring everything to a shocking, thrilling close."